The above quote is by far one of my favorite quotes from the book, Eat and Run, by Scott Jurek. And it totally sums up the reason why I run marathons. Today, was my first day of marathon training. I ran a short 3 mile run. I was relieved from the heat by a heavy rain. So far it has rained a ton this summer. Hopefully it will stay mild. While reading, Eat and Run, Scott Jurek compares himself to his hero Chuck Jones and Ron Nicholl. He also discovers bushido, which is a code of honor and morals developed by the Japanese. Bushido means letting go of the past and future, and focusing on the moment. Do you bushido while running? Or is your mind in constant thought? Do you run better when your mind is empty or do you run better when you are focused on your running? When you have been consistently running, or have properly trained for a race, you are physically capable to run the speed and distance you have trained for… But are you mentally strong enough? What mental strategies do you have, if any at all? A lot of runners have tricks like this. When my dad use to run marathons, he use to break the marathon distance into 4 different 10K parts. Hal Higdon, a marathon coach, states in his marathon training guide, that he wears a rubber band on his wrist, that every odd mile he switches it to the other wrist. I use to just let go, and run (bad form and all.) I wouldn’t really think of anything, my mind was empty. It was my quiet time during my day, my time to myself. But, I wasn’t becoming faster. I wasn’t becoming a better runner, having no goals. When I decided to change my shoe to Newtons, and really focus on improving my stride. I had to stay focused. During that time, when I was transitioning my stride from a heel striker to a more natural barefoot runner, there were definitely days when I missed the times when I could just go out there and run., with an empty mind. It was very exhausting physically running, and then mentally thinking about how to run properly, but I had to, I was invested in becoming a better runner. I totally agree, it is as simple as that… practice running the distance, and it will save you. However, Scott Jurek prepared his mind by standing in icy water. Sometimes running isn’t enough. Sometimes your need more. So in addition to the distance, mentally preparing for your race can take you to a different level of running, maybe even a new PR. Focusing on running while you run, can keep you injury free, and a stronger faster runner. You would be surprised how the mind can play tricks on you and actually turn a good race into a nightmare. Using mental strategies when you have approached that unbearable distance is just a SMARTER way to run. Do you just run? Letting your mind empty? Do you have any good mental strategies? Please share them! Proud to be a Runner. Proud to be an American. Before I wasn’t too worried about speed, and never did any speed work training. But now, I know I can run a 5K, 10K, 10 miler, half marathon, even a full marathon. I think after 2 full marathons, I finally have the right to call myself a runner. So it is time to take my running to a different level. I have decided it is no longer about, “Can I run this milage or not… ” because I have already proved that I can, physically and mentally. So my running is now about doing my personal best. And in order to break old records and create new ones for myself, I need speed drills. I was always confused on speed drills. Maybe that is why it has taken this long to try one out. But I tend to always complicate things, when really it is very simple. Hal Higdon says, “If you want to run at a fast pace, you need to train at a fast pace several days a week.” So that is what my plan is. The only thing that I regret is not starting this speed work training sooner. My half marathon is in less than four weeks. But my one fitness goal for November is to train properly for this half marathon. Training includes, speed work, tempo runs, long distance runs, strength training, and some mild stretching. On Sunday night, I felt really good, after I ran, my 5k speed work training run. So I decided today to try it again. Again I ran this on the treadmill. (I hate the treadmill, and usually run outside) This time, I started out running at 6.8- 7.0, for the first mile. Then on the second mile I brought it up to 7.0-7.5. The third mile I ran at 7.5-7.8. whole time I felt really good. I never felt like I had to stop. I felt like I could keep going. This is a very good sign, but I think I can push myself more. Next time I do speed drills I am going to do interval training and really sprint hard. Again I ran in my Newton- Distance U. This is the lightest and most minimalist shoe in my shoe rotation. Because of the shoes, my run felt light, easy, and fast. I still want to work on bring my Cadence up. I also have been trying to do more strength training. It is a must for me on days when I do speed drills. I am really trying to strengthen my core. So below are the details. seated dumbbell front raise – 3 sets (10 reps) 5 lb dumbbells – this was my favorite one and this one intensely works your abs. Also everyone knows what today is…. ELECTION DAY! So this morning I woke up at 6:40 am and was at the polls by 7:00 am. It felt good to be so productive before work – getting my work out in and my vote on. As you may or may not know, I live in Washington, DC, which is by far the most political area in the USA. Sometimes being surrounded by politics all the time can be exhausting and stressful, but today was a happy day. I am so proud have the freedom to vote. It is days like these that make me grateful that I was born an American. My sticker. My proof. I voted. If you haven’t had the chance to vote yet… it is not too late! This morning, I woke up at my normal time, 8:00 am, but because it was daylight savings time, the clock went from 8 to 7. If you have been following my blog, you may already know how much I love my mornings, so having an extra hour this morning was a real treat. Unfortunately, I didn’t squeeze in a morning run, so instead I hit up the gym after work. It is funny how things change. Four years ago, I was a gym rat, spending all my running time on the treadmill. But now, I can’t even remember the last time I set foot in a gym. Honestly, I hate the gym atmosphere and can’t stand the treadmill. However, I wanted to get in a short really fast run. The best place to work on speed is either at the track or on the treadmill, and because it is getting darker earlier, I decided on the treadmill. So I put on my pink Newton shoes, the Distance U, and headed to the gym. Time to get faster! Decked out in my favorite Lululemon. I did a brief warm up walk on the t-mill for about 1 minute. Then I ran the first mile at 6.5 taking the speed up to 6.8 the last two minutes of the first mile. This was around a 9 minute mile. Then I ran the second mile at 7.0 which is around an 8:30 minute mile. Then I ran the last mile at 7.5 which is an 8 minute mile or slightly under. I was pretty satisfied with my speedy 5k. At first, my Newton shoes felt really weird on the treadmill. But after a minute or two, I felt super light and fast, never feeling tired. It felt good to work up a sweat quickly and get those muscles moving. Do you prefer to run far or run fast? Where do you do your speed workouts? Treadmill or track? 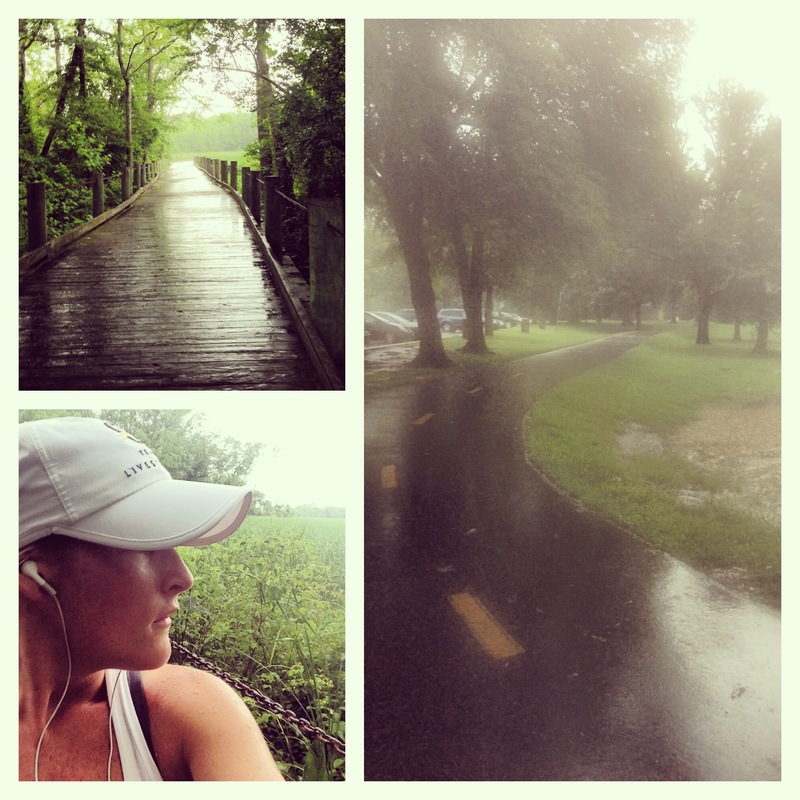 Half Marathon Training: Weather can make or break a long run! WEATHER can make or break a long run. Newtons and Camelbak. You guessed it- its long run time! Yesterday, I went on a 10 mile run with L. It was a really good long run. I never thought weather would effect me so much, but ever since I started running five years ago I remember how cold past winters have been and when we have had a heat wave summer. As for yesterday morning… it was sunny and around 50 degrees, perfect running weather. It is officially time to swap out my running shorts for running pants and tanks for long sleeve shirts. Yesterday, I ran in my adidas running capris and my brooks MCM long sleeve running shirt, (no lululemon- shocking I know) but I felt perfect, never too hot, never too cold. I remember telling L that I thought this was going to be a really good run… so mentally I was in the zone. Have you ever tried that before? In the beginning, of your next run, just say it out loud, “This is going to be a good run, I can feel it.” Trust me, by saying positive words like this, you are setting yourself up mentally for a really great run. Running can be the most simple minimalist sport ever. You can do it anywhere and all you need is a really good pair of shoes – or according to some runners, shoes aren’t even necessary. But when it comes to a run longer than eight miles I always bring my stuff. For this 10 miler, I was prepared in many ways . As I said above, I was dressed appropriately, and mentally set myself up for a success. Along with both of those things, I also had my Camelbak filled with two liters of water, my Jelly Belly Sports beans ( for fuel,) my iPod, my Garmin, keys, phone, money, and pepper spray. I was ready and feeling good. So L and I hit the MVT trail and headed south towards Old Town. Because it was around 9:00 am, the trail was pretty empty, only a few walkers. This was very relaxing, and heading towards Old Town is always very pretty, right along the Potomac. I was trying to run between a 9:30 – 9:00 minute mile for the first half hoping I could run the second half faster. I was sipping water every two miles, and fueled up with sports beans twice, once at mile 4, a second time at mile 8. The first half felt really good. I did have to stop two times to make sure L, who was right behind me, knew her way. We made it to Old Town and then turned back. On the way back, I felt really good, except for around mile 8, I really started to feel the ground in my Newtons. I believe this feeling is just a friction feeling of sweat, skin, and the ground all mingling. This sensation made it harder for me to maintain anything faster than a 9 minute mile, so I kept my pace at around 9:15. L and I ended up finishing in 1:40, and we both felt like we could have kept going farther – which I am pleased with. I am following the Hal Higdon Intermediate Half Marathon Plan. I love Hal. I was fortunate to meet him at the Chicago Marathon Expo! Although, I have never followed a plan for a half marathon, I have followed Hal’s plans for my marathon training and felt successful. So hopefully his half marathon plan will also bring me success. This week’s long run is a 15k, but depending on how I feel I might just do another 10 miler. The plan also includes shorter daily runs, speed work, and strength training. Durning my shorter training runs I am trying to run between a 8:30 and 9:00 minute mile. As for speed work, I might actually do some drills on the treadmill at the gym- even though I hate the treadmill. Yesterday, after my 10 miler, I did some strength training. Because I have changed my stride to a more natural running stride, it is very important for me to strength train. I have to mainly focus on my upper body and core. I did all my strength training using a stability ball, which works abs as long as shoulders and back. I also used dumbbells, and kettle bell. seated alternate dumbbell press – 3 sets (10 reps) 5 lb dumbbells – for a more advanced move try this with one leg crossed over the other. In the end, I was really happy with my 10 mile run and my strength training. I still need to pick the pace up and work on cadence, but besides that I am feeling pretty confident and excited about my half marathon scheduled for December 1st. Although, I have done four ten mile races since April, I never felt like I was running far or training for a long distance race. For some reason this felt like a long run for me. So let me tell ya- it feels really good to run long and hard again. I really missed going the distance. I need to continue to make time, at least once a week, to run long and hard. Do you bring pepper spray with you when you do a long run? How do you mentally get in the zone? On Sunday, October 21st, 2012, I ran the Army Ten Miler. With almost 22,000 runners crossing the finish line, this is the largest ten mile race I have ever run. I was really excited to run this race because as popular as it is, I had never run it before. Normally, I am running the Marine Corps Marathon, which always falls on the weekend after the Army Ten Miler, so I don’t really see a point of running a 10 mile race the week before my marathon when I am already passed that point in my training. The Expo was held at DC Armory. Because it is a military event, security was tight. Everyones’ ids were checked and in order to enter you had to go through a medal detector. The long lines went by quickly and we were able to get our bibs and t shirts. L with her bib number, and running in memory of her hubby who died fighting in Iraq. Me with my t shirt! What can I say… one of my favorite things to do is shop for new running stuff… So I love huge Expo’s with tons of vendors. One of my favorite vendors is One More Mile. One More Mile is a company know for the most hilarious phrases written on their t shirts. The shirts are not the best quality but they are fun and very comfortable to wear post race. The Expo was also very well organized and although I didn’t buy anything from them, I spotted two of my other favorite vendors, Garmin and Newton. So the night before my race, I prepare everything. I get my my race outfit ready. I pack my baggage claim bag. Then I take a picture of everything and upload it to Facebook. All of my runner friends get it, and all of my non running friends think I’m weird. But that is what I do and L started to do the same thing. I guess you could call this a ritual, because I do it, the night before every race. This helps me at 5:30 in the morning, when it is too dark to see. I don’t need to see because everything is organized. If you are interested to know what makes up my race outfit please click here. I review each product in detail. On the morning of the race, I received a “wake up” text from L at 5:30 am. Because I had prepared my race outfit and baggage claim bag the night before it didn’t take me long to get ready. The only thing I couldn’t find in the dark that morning was a hair tie which is ironic because I am a hairstylist. I normally have a pixie haircut and never needed to worry about my hair. Anyway, L picked me up and we drove five minutes to Pentagon City where we parked and met up with friends. The start of the race was at the Pentagon, and although the Pentagon is walking distance from Pentagon City we decided to hop on the metro. One of my favorite things about race morning is riding a metro train packed with runners. The energy that fills the train is intense, exciting, and positive. It really gets me pumped up. 30,000 runners at the Pentagon Metro stop. Although, it was a little bit cold, L and I stripped down at the start and checked our bags. We got one last group shot and then headed to our corrals. The whole gang at the start! I love military races because they always have the most organized races and the most entertaining start lines. At the 2012 Marine Corps Marathon, all of the runners huddled together on 110 while they flew Military Jets over our heads. At this race, military men/women entered the race by sky diving to the start line. Then the gun went off and the race began. Honestly, the start was a slow one for me. Once I started running, I began to feel really crowded and couldn’t run at the pace I had planned. We ran down 110 to Arlington Cemetery. I love running on highways that I normally drive on. As I ran down 110 I began to remember the last time I ran down that highway, in Marine Corps Marathon. We ran up to Arlington Cemetery and then over the Memorial Bridge. This part of the race was also very familiar because it is a part of one of my regular training routes. Then we ran around the Watergate Hotel, the Kennedy Center, the National Mall, then over the 14th Street Bridge. The 14th Street Bridge is cool place to run over because it brings you from DC to Virginia. However, it is also an annoying place to run because whether you are running a 26.2 or a 10 miler it is a place that is hard for spectators to get to, and a place you really need support, being a spot towards the end of the race. The 14th street bridge also brought back memories from when I ran the Marine Corps Marathon. This was around mile 20 in the marathon and mile 8 in this 10 miler. So far, besides a slow start from crowding, I was feeling pretty amazing. I was running with natural form, landing on my forefoot. Legs felt strong. Breathing was good. My form was perfect, staying balanced and focussed. landing lightly on my forefoot! A tad bit of an over stride. The photos never lie. However, it was on the 14th Street Bridge in this race that I started to feel a weird burning blistering sensation on the bottom of my feet. I continued running, and even sprinted to the finish line. After the race I checked the bottom of my feet and only had one small blister, and it wasn’t even a blood blister, so I guess it was just from friction feeling the ground. So although, I felt pretty amazing through most of the race, it is times like these (when I feel an unusual discomfort) that I begin to question how far I truly can run in the Newton shoes. Once over the bridge, the race route took us down to Pentagon City and finished where we started, at the Pentagon. Because L and I parked at Pentagon City, we decided that once we go our bags from baggage claim we would just walk over to the car. So thats what we did, which was shockingly quick and easy. Overall, I though this race was pretty well organized, but not as organized as the Marine Corps Marathon. I though the route was pretty amazing and in the end I recommend this race to anyone and everyone. When I first started using the Newton shoes they felt extremely fast and light. I love that weightless feeling, however I have yet to PR in them. Since April I have run four 10 mile races two of them in my traditional running shoes, and two of them in my Newton shoes. These may sound like excuses but, the Annapolis 10 miler was run in a hurricane, and the Army 10 miler was crowded at the start. But overall, I feel pretty consistent when it comes to my times. December 1st I will be running the Annapolis Half Marathon, in my Newton shoes. If I get 1:59:00, it will be a PR for me. So I am hoping for that. What is your favorite vendor at the running Expos? What is you race night ritual?